Present at CHM were Ron Williams, Don Cull, Glenn Lea, Bob Erickson, Jeff Stutzman, Frank King, Robert Garner, ... Ed Thelen put in a cameo appearance (catch me if you can ;-) Allen Palmer, Grant Saviers and later Jeff Stutzman worked at Grant's machine shop. The following reports gleaned from e-mails among the tape guys and a phone call with Ron Williams. Allen, Jeff and Grant worked at Grant's ranch machine shop " ‘powdering’ the clutch units. Actually, measured amounts of clutch magnetic powder are used. Four more to go and then we need to cut & replace all the back plate felt washers. Then we can put the shaft assemblies back together." "All the pulley's are off and cleaned for all other motor sets, I believe Grant has ordered replacement hex set screws, that's about as far as we got last Thursday." They plan to work there Saturday continuing the same project. Then Allen is off on vacation for a week - again!! How much vacation time does he think he deserves?? Like just because he is retired he doesn't need to act like it !! Is the tape team meeting at Grant's place Thursday? Kristin Abkemeier came back from San Francisco and talked extensively with Bob Erickson and Robert Garner and Frank. Don Cull and Frank King retimed the punch side of the 1402 reader punch. Next time they will re-connect the wires to the re-timed CBs and try punching again. Ron Williams and Don Cull worked trying to get the printer functioning again. You can print a blank line, but a non-blank in any column will trigger an early error and prevent printing. Ron says the logic around the print core buffer is tough to trouble shoot. Among other things, even the status of print success of each print column is stored in the cores of the print buffer. 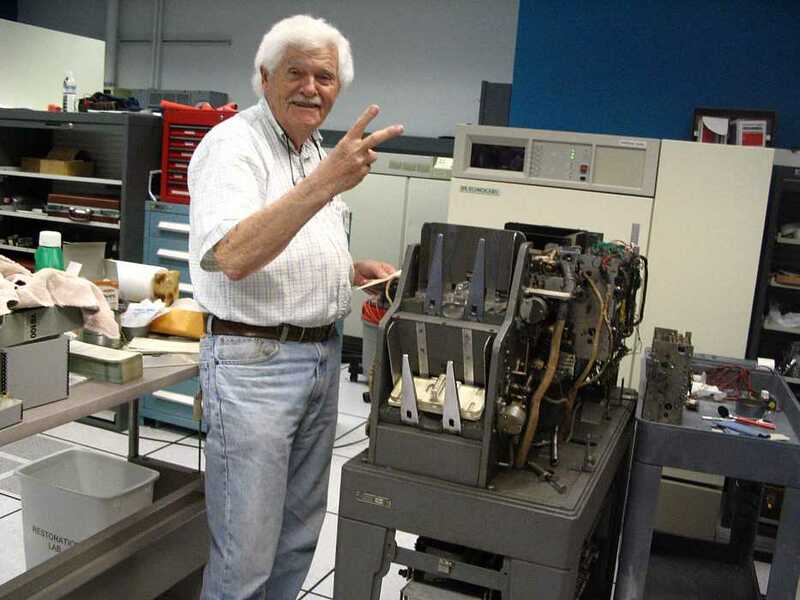 Bob Erickson and Glen Lea worked on the 077 collator. Present were Ron Williams, Allen Palmer, Bob Erickson, Tim Coslet, Frank King, Jeff Stutzman, Ed Thelen. Ron Crane came in at 3:00 for a few hours. This was a CHM volunteer work day, and also a going away lunch for Bill Selmeier who has lead the 1401 card reading effort, is a lead CHM docent, active in Corporate Histories Collection I know there is content in there, just how to access it? 28 clicks later still haven't gotten anything., very active in recording computer people histories, InfoRoots, made us all feel good, put in over 1,500 CHM Volunteer hours during the past three years, has an active computer oriented web site, and I have lost track of what else - ... . Bill is moving to North Carolina and will experiment with Remote Volunteering. Ron Williams is working on the 1403 printer controller which failed a week ago. 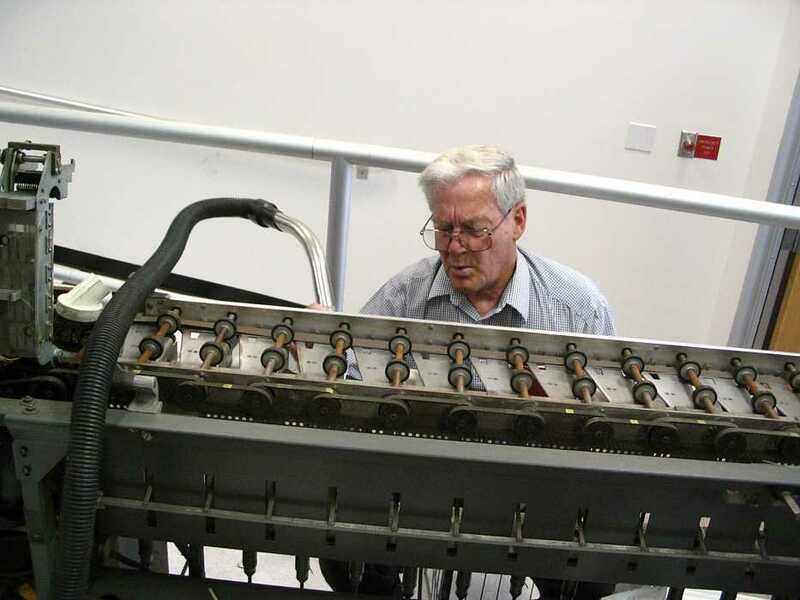 Frank King is cleaning and tearing into the 083 1000 card a minute sorter. And here are more parts to take to Grant's place to clean. Grant donated some power resistors and switches to make loads to test all power supplies in a 729 simultaneously He also donated an aluminum plate that he had dumpster dived from CHM scrap as a heat sink. Tim and Ed used Bob Erickson's punches to mark holes in the plate. 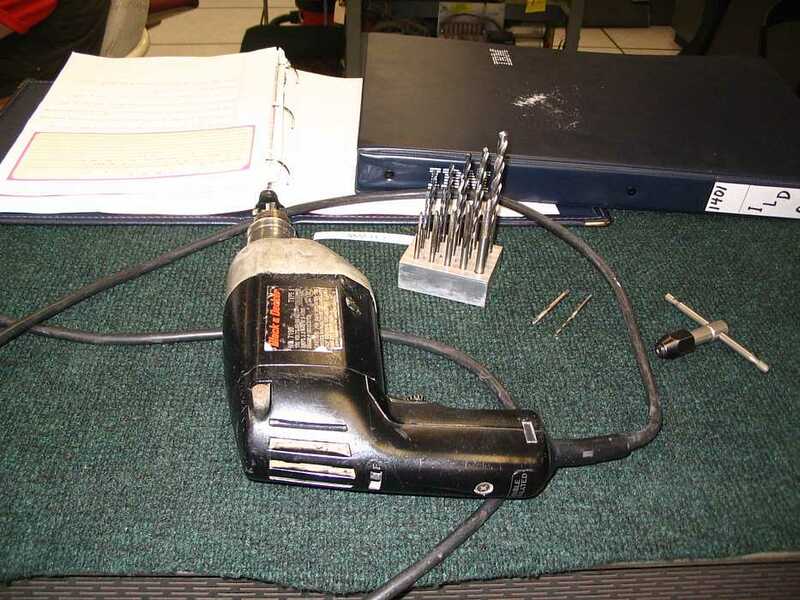 Ed drilled and tapped the 46 holes - a brand new experience - using Ron Williams drills and 440 taps. Tim mounted the 23 resistors on the plate. Now - about the environment - yesterday, there was no office - look what happened in a day. Ron Williams just one-upped me - again. How to get even?? Will I ever get even?? Tim Coslet has hand coded (via Palm Tungsten spread sheet address calculation) a powers of 12 program using the multiply instruction. He is waiting for Ron to get the printer controller working again. Hey Ron - did I get you back? Grant played Santa, bringing in an air compressor (used today on the 077) and a big box of parts I didn't examine. 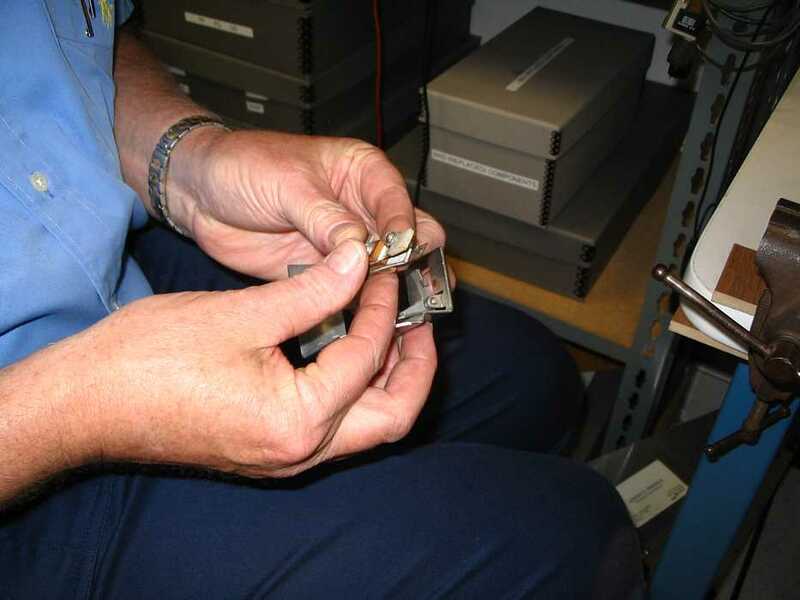 Glenn Lea and Ed Thelen soldered connections on the resistive load panel for full load testing of 729 tape drives. We can now dissipate about 600 watts into that big aluminum plate (hmmm - for how long?) Ron Williams suggests that we have plenty of fans. Bob Erickson showed Grant the funny 077 collator motor vibration. Grant suggests that there is too much runout play on the main shaft - I think he thinks there is a reasonable fix. 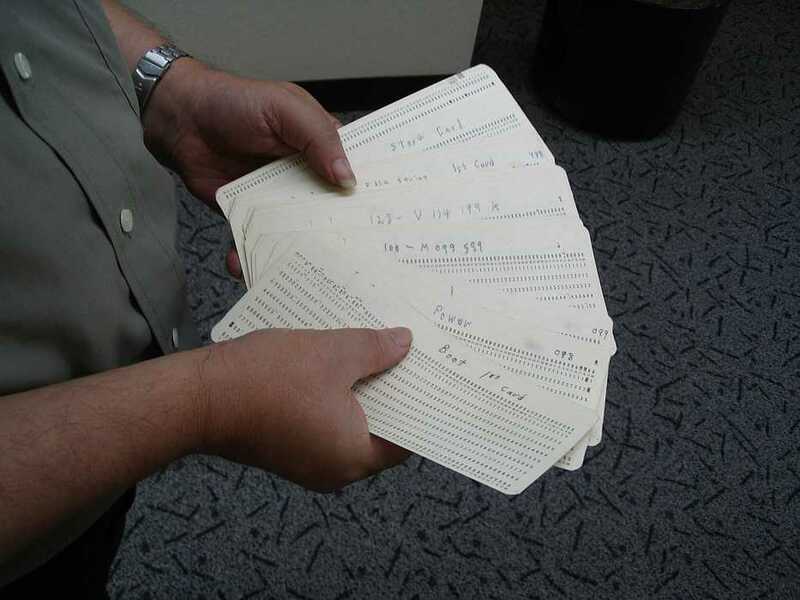 The re-timing exercise by Don Cull, Bill Flora on the 1402 card punch seems to have yielded positive results. Frank and Glenn reworked a stripped thread on the 077 collator. Ron Williams had the required taps in his car. It's hard to do TAU debug or "online" tape drive debug on Wednesday. Too many people are trying to be productive. Only one can be on the 1401 at a time. I propose that we have a Thursday session at the CHM to try to debug the drive and TAU. Present were Ron Williams, Bob Erickson, Bill Flora, Don Cull, Grant Saviers, Robert Garner, Ed Thelen. 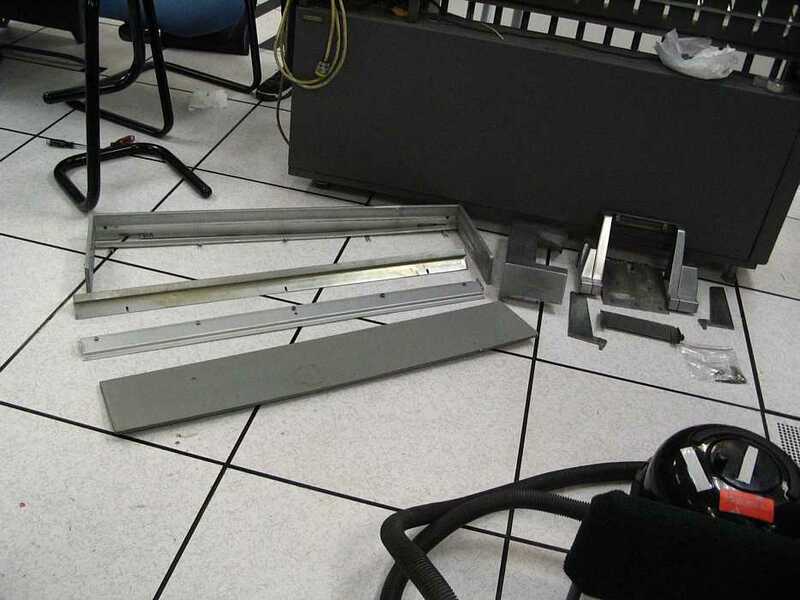 Bill Flora and Don Cull found the card stacker lever contact closure had erratic resistance. (The resistance should be essentially zero or multiple megohms. 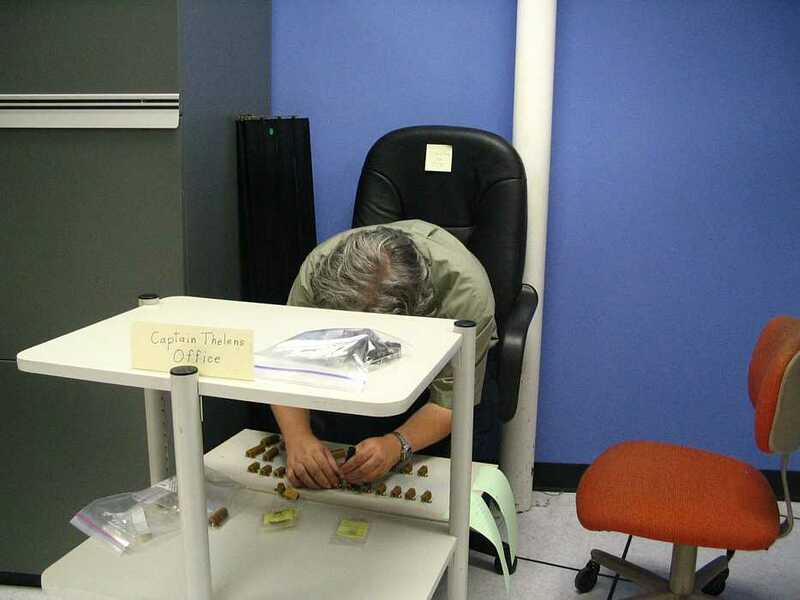 They were measuring 10, 20, hundreds of ohms - varying all over the place.) They burnished the contacts again and it still misbehaved. We put in a hurry request to swap with one in Visible Storage - which looked "oxidized" but had consistant resistance readings of less than an ohm or extremely high depending (correctly) on the position of the lever. Good - and "what is the rest of the story?" - I (Ed) looked at the contacts through magnifiers and the lovely binocular microscope - and found that the silver contact material was loose in the hole in the spring metal - the contact wiggled - and apparently made intermittant electrical connection "depending". What to do?? Who would know? 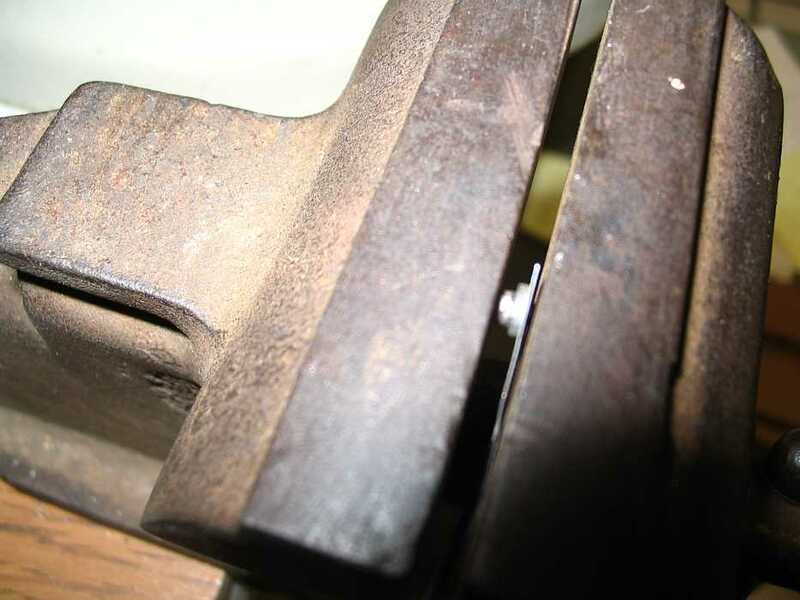 Just then Grant Saviers showed up - said "This is simple"
Squeezed the loose (soft silver) contact in the vise, "swaging" it to fill the hole, like a rivet. There is still a relay in the punch circuit that doesn't pick First card operation, punches 1st card, passes 2 more but doesn't stack anything. To get the card stacked, you must hit the NPRO (non process runout) switch or issue another punch command. We set up the 729 to connect to the 1401 and the Tape Channel Analyzer on Port A; and with a terminator on Port B. Rather than disconnecting cables to isolate the drive, simply switch the port control switch to "B" for offline operations. Be careful, the floor tile behind the drive is removed. We removed it to troubleshoot an imaginary dual-port relay bug. We also set up the AC connections so that the drive, Analyzer, and scope have a common ground. First we verified that the TAU/drive did not regress since we last worked on it. Previously verified functionality still worked. We checked the Read Bus signal levels. They are 8Vp-p at the TAU receivers. These levels are correct for the Read Bus. We continued to debug the read-back part of the Write operation. Read Data from the drive is supposed to be latched in the TAU's A and B regs. two card in the reset circuit. two cards in the datapath to these bits. examined a card (see the log for the specific card). We had a solid "No Echo" error, we repaired the "Echo Pulse" receiver card. We greatly missed the soldering station. 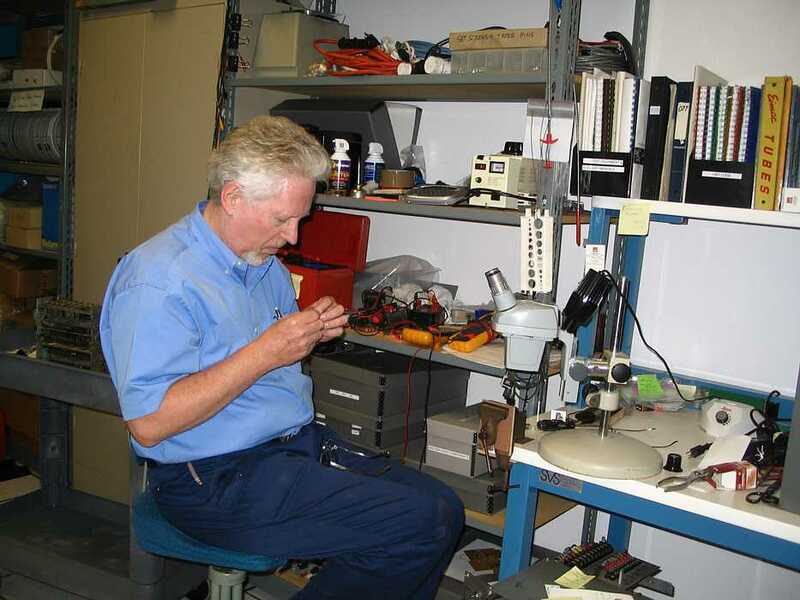 We used Ron W's ancient soldering iron to perform all of the repairs. The drive drops "ready" status during Write and Rewind operations. When this occurs, the drive will not respond correctly to buttons or TAU commands. We had to power-off the drive to reset it. The reset buttons/switches won't clear the state. In this state Load/Rewind sometimes puts the tape into slow speed rewind when it should be in high-speed rewind. The TAU detects "Skew" errors. The occurrence of this error sometimes stops the RC counter. Just prior to the skew error we observed excessive jitter on low order RC bits. The good news is that CP16 did not pop today. I believe that Ron C. fixed it. I suspect that the read-back control state machine is not properly transitioning from "Read Cond" to "RDD". The loss of "ready" status may be something that can be recreated with the drive in offline mode. If not, I think that Jeff knows how to start a TAU originated Write operation. The failure typically occurred once for every two times through a tape. Grant Saviers and Ron Williams were present working on the 1403 printer that had worked well for months - then suddenly quit printing. They found a broken wire feeding -12 volts to E1 amplfier in the 1403. These local amplifiers magnify the weak magnetic sensor voltages for use at logic levels.. The E1 amplfier in the 1403 helps sense when paper has advanced one line. If the amplifier does not work, you get indefinite carriage runaway. Ron mentions that some indicator lights turn on extremely slowly - like seconds. 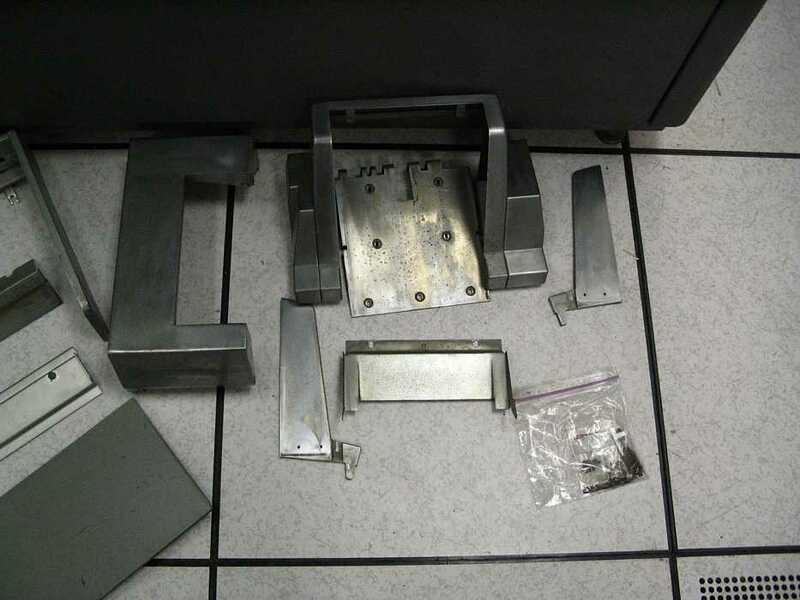 Here is a picture of the "belly dancer" (an IBM term) where the broken wire was found Wednesday. This tab plugs into the socket that holds the SMS card that has the amplifier. Van Gardner sent: "The photo of the "Belly Dancer" terminal is not the original terminal that got that name but the one that replaced it. The original terminal was used on the 729 Tape Unit electrical skew adjustment jumpers. The end of the terminal was rolled over to fit over an SMS socket pin. To make it fit tight a crease was stamped across the rolled end and this made the roll gap open and bulge out. This bulge was what gave it the Belly Dancer name. These terminals worked ok if there was only one wire wrapped on the pin but if there were two the jumpers would come off if something bumped them. The jumper I have pictured is one I ground about an 1/8" from the front to get the crease further down the pin. I made a bunch of these to use when installing RPQs on 1401s. 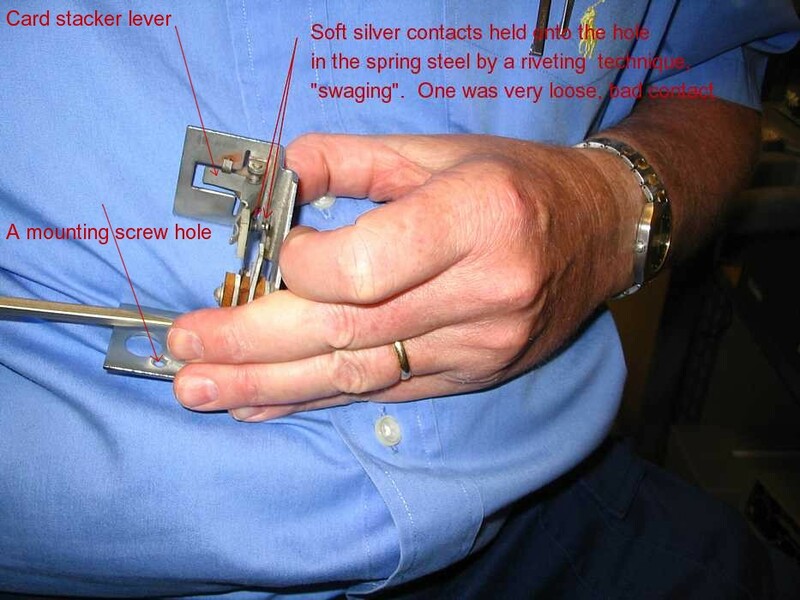 The jumper you have pictured is one engineering came out with that grips the pin tighter and further down." - Ron Williams found he also had to re-magnetize the "drum" that rotates past the the magnetic pick-up whose amplifier had not worked due to the broken wire. - Ron says that the wire was of stranded copper. Now he is down to 4 pages of logic to locate additional faults in driving the 1403 printer. Present were Ron Williams, Bill Flora, Bob Erickson, Don Cull, Ed Thelen. Robert Garner, Grant Saviers and Jeff Stutzman were there up through lunch break. 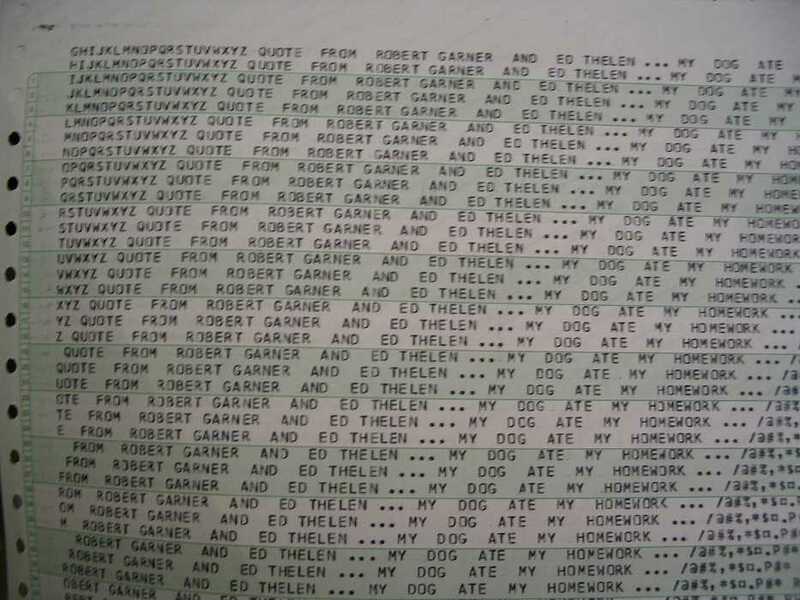 Allen Palmer reported that he was going to be at Grant Saviers' workshop today? Bill Flora and Don Cull found and replaced this kind of relay (in series with that bad contact) that was also bad - it did not "pick" or close. Unfortunately, the 1401 now gives false punch checks - error status. 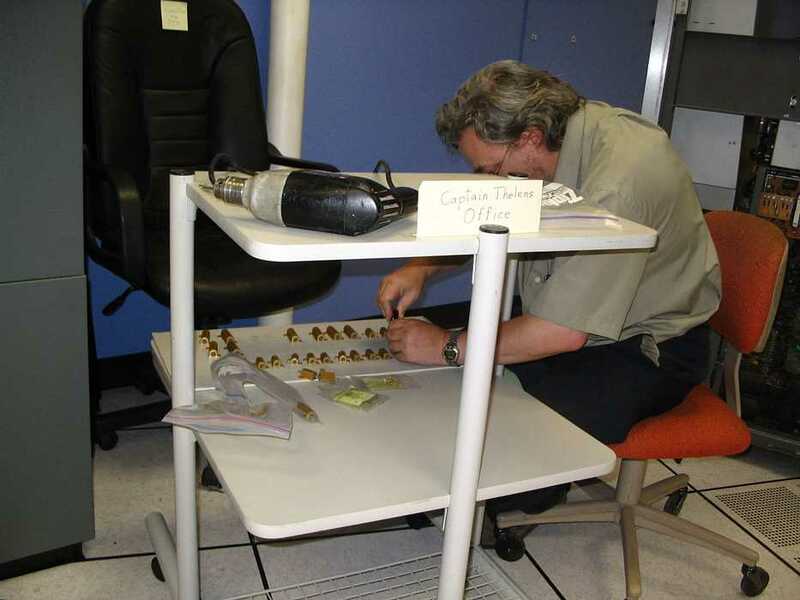 Bob examined the work table and floor carefully - then trolled the table and floor with magnetic screw drivers and magnetic pickup tools - Bob was amazed that he was picking up magnetic dust. One of my first jobs was in a machine shop that had a large surface grinder. Mounted on the carriage was a large magnet with a lever on the side. One day when I was cleaning the grinder I took the magnet off and turned it over to see how it worked. It was a very simple arrangement. The lever rotated every other magnet end for end canceling the magnet fields instead of adding them. 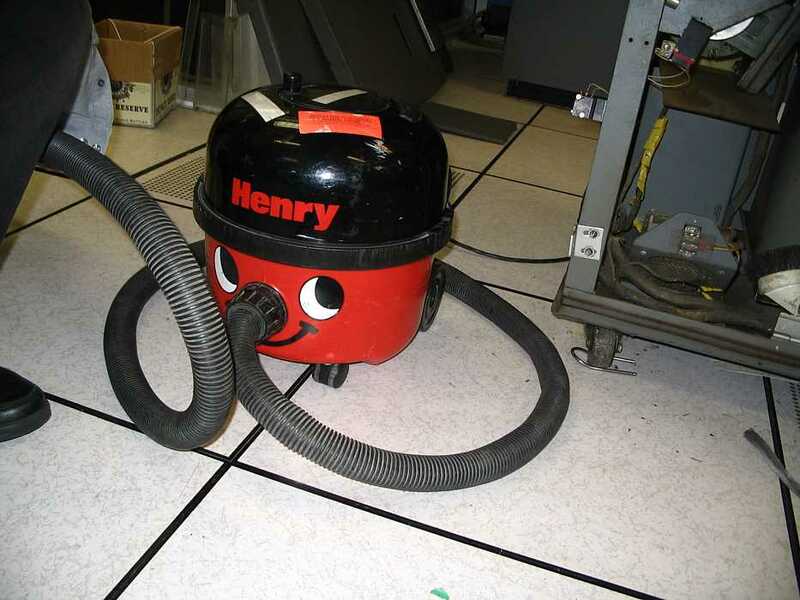 We then put a new bag in the vacuum cleaner and vacuumed the floor - got the usual dust but no spacer - a bad day in Mudville. Bob Erickson wanted to test a replacement spacer he made to replace one that got lost somewhere on the floor. That seems OK - Bob worked on cleaning the printer wires ultrasonically and print plate alignment. Bob's driver, Ron Williams came in and fixed the 1403 printer - for details ask Ron. Ron punched 1000 card deck with 1402, not punching in column 2. This deck, all sequentially numbered, is for a future test of the 077 collator.